These leggy dogs are the second fastest animal in the world, with peak speeds of around 43mph. But this fast ability is both a blessing and a curse – speeding round a track is what they are bred for but once they slow down due to age or injury, they no longer have a purpose. They do, however, make great pets and are often taken in by rescue centres. A greyhound’s racing days are usually over by the time he or she is 4 years old, but on average greyhounds live to about 12 years old, meaning they could potentially have many happy years of retirement. Arthur Robinson, founder and president of Dumfriesshire and Cumbria Greyhound Rescue says greyhounds are actually very lazy and affable. Because they are sprinters rather than long distance runners, they do not actually need a huge amount of exercise. Mr Robinson said two 20 minute walks a day would be sufficient or if you have a field, just let the greyhound run around in there. ‘Although greyhounds are not bred as a pet, they are very very easy dogs to keep and they have a very good temperament.’ Says Mr Robinson. 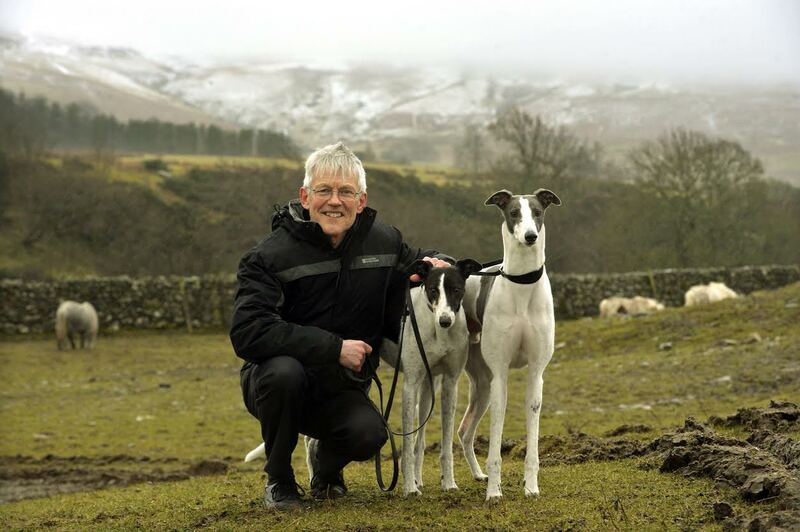 David Kerry, the chair of Dumfriesshire and Cumbria Greyhound Rescue, has two greyhounds himself, Caris, who is 11 and Joey, three. The Dumfriesshire and Cumbria Greyhound Rescue has rehomed around 1,060 greyhounds since it was established 14 years ago. Mr Robinson set it up after becoming involved with the Greyhound Awareness League in Glasgow and deciding a rescue centre was needed in the Dumfries area. The rescue centre rents kennels in Lockerbie, Caldbeck and near Penrith. It currently has 16 greyhounds in kennels at the moment waiting for new homes and a waiting list of 14. Concerns were raised in a recent government report about the welfare of greyhounds during and after their racing life. Ministers from the environment, food and rural affairs committee looked into the welfare of greyhounds and the effectiveness of regulations around dog racing. They have called for many improvements, in particular with regard to transparency in the industry and to bookmakers contributions towards dogs’ welfare. It is hard to create a comprehensive picture of greyhound welfare because a lot of data for example how many greyhounds are injured or rehomed each year, is neither systematically collected nor publicly available. During their inquiry, ministers found no sources of reliable data regarding greyhound welfare in the public domain. Although the industry has to record injuries because of regulations brought in in 2010, It does not have to publish these and has chosen no to. Furthermore, there are no comprehensive records of what happens to greyhounds after their racing days are over. The Greyhound Forum, which represents eight major dog charities, estimates that 3,700 of a total 9,000 retired greyhounds go ‘unaccounted’ for each year. Figures from 2014 which are not comprehensive, show that of all raced dogs that year, 693 had hock or wrist injuries and 393 were put down. These numbers represent less than one per cent of all dogs raced that year. Defra wants greyhounds bred for racing to be traced from birth to death to remove any uncertainty over their fate and has recommended that the industry should be required to publish welfare data, relating to injury, euthanasia and rehoming numbers. One piece of legislation that should help with this is that, as of April 2016, all dogs in England over the age of 8 weeks will have to be microchipped. Mr Robinson thinks that in reality, most dogs are taken to rescue centres rather than needlessly killed. After all, he adds, it’s cheaper to take a dog to a rescue centre that will take it for free, thank to pay a vet to put it down. He says ‘ I think the vast majority of owners now bring their dogs to us whereas before they were taken to the vets if they were lucky. If they were unlucky they were taken behind a shed and hit with a hammer’. Injured dogs are also often brought to Dumfriesshire and Cumbria Greyhound Rescue as well as greyhounds retiring because of their age. The centre pays for any vet fees and Mr Robinson explains that even though dogs may no longer be able to race because of injury, it does not mean they will have to be housebound as, though they can no longer run at 40mph, they can still go pretty quick. The Dumfriesshire and Cumbria Greyhound Rescue, which has a shop in Lockerbie, relies entirely on donations from members of the public to look after greyhounds and find them homes. The nearest racing track is Halcrow Stadium in Gretna, an unregulated, independent track which Mr Robinson says does support them. In the past the charity has sold Christmas cards there to race goers. Mr Kerry says:’ We are lucky because we have good co-operation from the race tracks’. In greyhound racing, there are regulated and unregulated tracks. The majority of tracks, 24, are licensed by the Greyhound Board of Great Britain, whereas independent tracks, of ‘Flapper tracks, are regulated and inspected by local authorities. Mr Robinson explains that if you want to run a dog on a regulated track, you have to persuade a trainer to take it on but on unregulated tracks, the owners are responsible for the dogs and run them on the track. Although people from all over Cumbria and further afield attend races in Gretna, the popularity of independent tracks has seen a notable decline in recent years – four have closed in England in the last six years. Often when dogs stop attracting big money, they are then sold on and go on to race on an unregulated tract. Betting is a huge part of greyhound racing, with the bookmaking industry making millions from it every year. In their report on greyhound welfare, ministers raised concerns that although gambling companies make millions of pounds in profits from dog racing their voluntary contribution towards dog welfare has seriously declined in recent years. In 2014, the last year for which figures are available, gambling companies made a net profit of £237m from greyhound racing. However, bookmakers’ contributions to the British Greyhound Racing Fund, which pays for welfare and prizes, have more than halved over the late 10 years: down from more than 14m to £6.9m. Of that sum, £2.9m was allocated to welfare. MP Neil Parish, chair of the environment, food and rural affairs committee, said, ‘Bookmakers who profit from greyhound racing should contribute to welfare standards regardless of whether the profits are from high street stores, online or overseas betting. However, gambling companies only support regulated tracks, unregulated tracks like Harcow Stadium at Gretna received nothing. Furthermore, Dumfriesshire and Cumbria Greyhound Rescue and other charities receive no funding directly from the betting industry and rely entirely on members of the public to help them look after greyhounds.